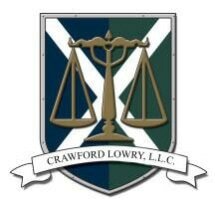 Crawford & Lowry, LLC, is a dynamic law firm in Canton, Ohio, that provides high-quality legal representation in the areas of family law, criminal defense, personal injury, probate litigation and more. Our partners have more than 60 years of combined experience in Ohio courts. Our approachable lawyers are committed to providing individualized personal service and exceptional representation aimed at obtaining the most favorable outcome in every case. Ian Crawford is a trial lawyer who represents both individuals and small businesses. He is a skilled negotiator and formidable trial lawyer who knows how to prepare and present a case. He focuses primarily on personal injury cases and consumer protection law, but has effectively achieved results in a wide variety of civil trials in his distinguished career. He is Board Certified in Civil Trial Advocacy by the National Board of Trial Advocacy and an active member of local bar associations. Jennifer Lowry has dedicated her entire career to family law. She draws on her knowledge of the law and the local courts to provide exceptional representation to effectively resolve difficult family law problems. She will provide you with straightforward advice and tenacious representation in divorce, child custody and visitation matters, spousal support disputes, dividing property in dissolution and post-judgment modification disputes. You deserve to know that your best interests and rights will be protected. When you work with our law firm, you will work exclusively with a partner-level attorney who focuses on the distinct area of law that is relevant to your legal problem. To arrange a confidential meeting with one of our highly skilled attorneys, call Crawford & Lowry, LLC, at 330-353-8925.